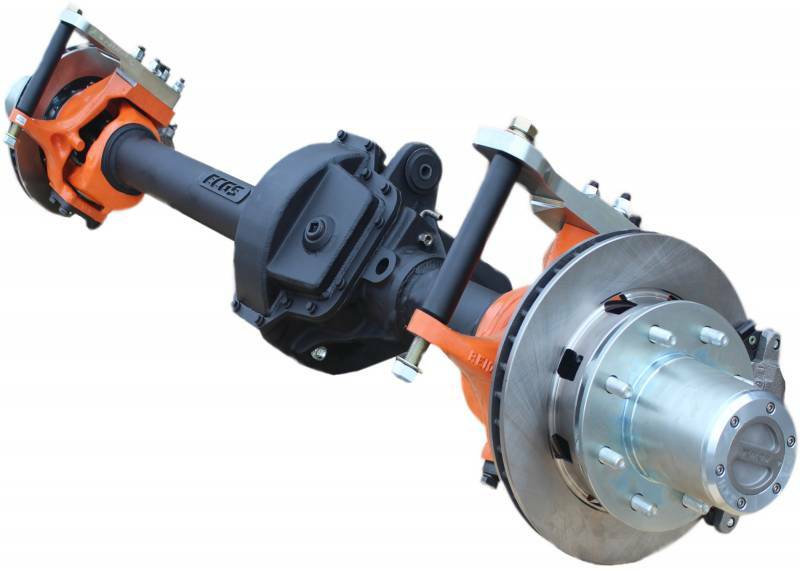 The ECGS Dana 60 High Pinon Front Axle features the highest quality parts available on the market. Using the bulletproof Dana 60 High Pinion center section we build the housing to your specifications. This option comes with new 8 Lug Chevy wheel hubs, new rotors, new calipers, new pads, new spindles, new wheel bearings and spindle bearings. If you select this option you get Reid Racing Chevy Knuckles, ECGS High Steer Arm Kit with ARP Studs and all new Kingpin parts including forged lower caps. Choose between the Reid Racing Kingpin Bushings and stock nylon bushings. We start with 35 Spline inners and use 35 Spline Outers. We use Yukon shafts and Chevy/GM 12" 35 spline stub shafts. RCV Shafts are also available, using 35 spline inners and outers. Select your choice between the most popular carrier options on the market. Including: ARB, Spool, Grizzly Lockers and Detroit Lockers. We use new Yukon Gear Ring & Pinions as well as OE Dana Spicer 10" Ring and Pinions in 4.88 and 5.38 ratio only. You must select a locker or spool for this option!